After finally graduating with a culinary degree, Jennifer Lim is pressured by her family to work at her control-freak aunty’s restaurant. But after a family dispute, Jenn is determined to no longer be a doormat and instead starts her own catering company. Her search for a wine merchant brings John into her life-a tall, dark, handsome biker in form-fitting black leather, who’s Hispanic to boot. It would be wonderfully wild to snag a man like that! Shy engineer Edward tentatively tries out his birthday present from his winery-owner uncle-a Harley-Davidson complete with the trimmings. Jennifer seems attracted to the rough, aggressive image, but it isn’t his real self. Is she latching onto him just to spite her horrified family? And if this spark between them is real, will showing her the true guy underneath put it out? 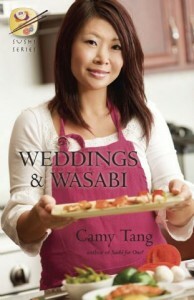 I’ve been a fan of Camy Tang ever since I heard about her and read the first book in her Sushi series, Sushi For One?. I liked that she wrote chick lit with an Asian flavor, and while I’m not Chinese/Japanese like her heroines are, I find that I could relate to the family and growing up woes that the four cousins experienced. And they’re Christian, too, so the stories resonate with my faith. Jennifer Lim is the nicest among the cousins, so nice that she knows she can be a doormat sometimes. When she finally graduated from her culinary degree, she finds herself pressured with having to fulfill some family “duties” that her aunts had pressed upon her. After a particularly bad party with an encounter with her ex, Jenn finally stands up for herself and starts a catering company. This starts her adventure that brings Jenn into learning that it takes a lot of courage to follow your dreams and even more to leave those dreams and trust that God will make things happen. It felt nice reuniting with Camy’s characters again. I love the bond that Lex, Trish, Venus and Jenn had, and how they would always be there for one another no matter what. I also loved and hated their family. I don’t know how Chinese/Japanese families really are, but their Aunty Aikiko really grated my nerves. How can a relative be so manipulating and conniving and just…annoying? Ugh. It almost felt a bit unreal with that aspect, but who knew, right? Maybe people like that do exist. I like how things came into somewhat of a full circle in this novella. While this could be read as a standalone, like the first three, but I think reading all of them would provide a fuller experience with the story. I always find back stories interesting, so knowing what happened to who in previous books while reading this one helped a lot in appreciating the events in this more. I especially liked how one of their cousins seemed to be friendlier to them now, and how their grandmother played a surprising role too. Weddings and Wasabi is available now in print and ebook through WinePress, Amazon and Barnes & Noble.